June 5, 2011 by Venky. My Hawk.. in the default avatar.. The Hero Hawk is my first bike. That is the bike that re-introduced me to the joys of cycling. So, I’ve a soft corner for it. It started out as an idea to mix exercise with something that I do every day, i.e., commute. Then it slowly grew into a passion for cycling beyond the daily commute. But the stock Hero Hawk 10 speed that I bought for INR 3.9k had really crappy components. Oh well, for that money, what would you expect? I hardly noticed anything wrong with the bike as long as I used it just for commutes. But, as the mileage increased, the limitations of the bike began to show up. The first pain point was the pedals. The stock plastic pedals were so crappy that they just gave away and the axles bent under my mashing. The resulting wobble in the pedal gave me my first cycling injury. I experienced severe pain in the left knee. That kept me restricted to just commuting. Changing the pedals didn’t help after a while. Then I suspected the left crank itself. The stock brake levers were something that I actively disliked. The lever extensions from the brake levers that went parallel to the handle bar top which are supposed to be used when your hands are not on the brake hoods were grossly ineffective. Not that the brake levers themselves were any better. So, if I wanted to use the brakes, I had to effectively go on to the drops to get proper leverage. The stock tires were amazingly supple and prone to bubbling and I had to change them very frequently. Punctures were too frequent. The stock shifter and derailleur setup does get the job done albeit with a frequent tune up. But I was not particularly pleased the way the shifters looked or the amount of handlebar space they took up. I kept tinkering with the bike, adjusting the components from time to time but I lived with it. Then after around 10 months of buying it, I had to hand it over to my nephew as I had to go to US (VT) on work. Before going there, I researched a bit about the cycling scene and cycle shops in the region and found a bike co-op where you could volunteer in assisting the head mechanic with bike repair. In return, you could build yourself a bike from the parts available there. I built myself an MTB there and understood what difference the quality of the components can make to a bike while working on different bikes. I worked on many classic road bikes restoring them and in the process the thought of turning my Hawk into something similar came into my mind. I didn’t want to spend a fortune on it. So, I decided to pick up some used parts from the shop for it and brought them back along with me. The crank set was the first one that I picked up. It was an used crank set. I hand picked relatively new but used chain rings and put the crank set together. I didn’t find any decent used aero brake levers in the shop. So, I used a bike shop gift coupon that I had and bought the CaneCreek SCR-5 aero levers for $40. This is the most expensive modification I’ve made. But I love the fact that I am now able to ride with my hands on the hoods. And I get decent leverage from the hoods as well. I would think that the quality of the Jagwire brake cables that I used along with them have some say in that. I decided to change the tires to Schwalbe Marathons 27×1 ¼ that cost me INR 2.4k. They were brought in by a friend who was coming back from a trip to UK. While at it, I also changed the tubes to presta tubes. I just used 700*28c tubes and didn’t bother scouting for 27” tubes. The ride quality is completely different with the tires. 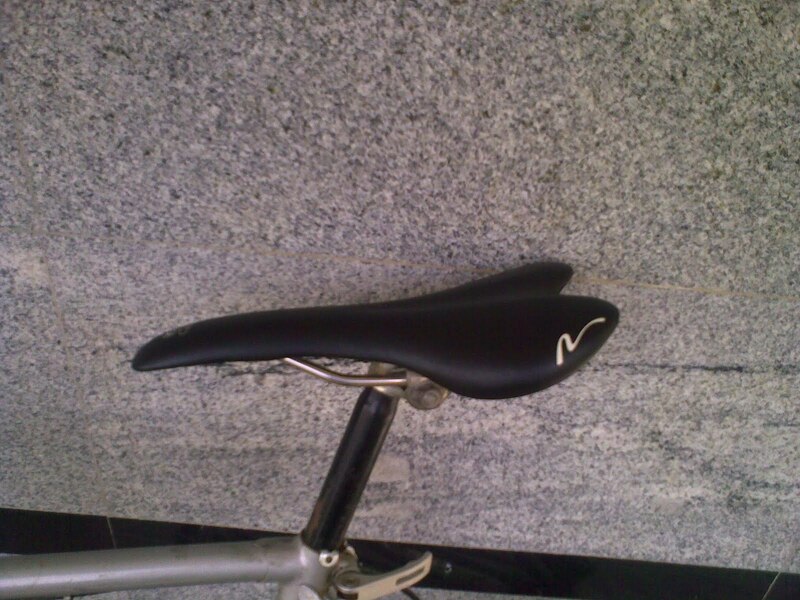 I bought a Nashbar R2 race saddle as a backup for my Bulldog’s saddle. But I ended up putting it on this. I’m happy with it. No chaffing even when riding in work clothes which used to be there with the stock saddle. Decathlon classic road pedals with toe clips.. I initially had SPD pedals on this but when I shifted the SPDs to the Bulldog, the classic road pedals from Decathlon made their way on to this bike. So did the toe clips that I had on the Bulldog. I still don’t like the looks of the BTWin bottle cages on the bike but I’ve to live with them until I find a way to put on some simple classic looking holders there. The front brake was changed to a 20 year old DiaCompe brake that I bought from Balu. The back brake was a misfit. Not sure why the difference in the two. I picked up an old stock of brand new Suntour down-tube shifters from the same co-op bike shop in VT. But they were left behind when the friend who was bringing my luggage decided to bring an extra pound of chocolates and left behind the plastic cover with a few bike parts. Thankfully another friend who was coming back last month brought this back with him when my constant follow-up made him understand how important these little bike parts are for me. So, I picked up these shifters from him when I went to Hyderabad last week. Obviously, it was him that I visited first after I landed in Hyderabad. Well, is it worth it spending to pimp the bike up like this? I would say it is! Firstly, there is the sentimental aspect of trying to hang on to the first bike and trying to make it a better bike. Then, I didn’t spend a fortune. Except for the Cane creek aero brake levers and the Schwalbe Marathon tires, most of the parts are either used and/or cheap. But the bike has become immensely better to ride. Now, it is now my full time commuter as I stopped using the Bulldog for commutes. I think the mudguards would go back on looking at the continuous rains in Bangalore. But at 14kilos, it is still heavy as it is even without the mudguards. I installed the shifters and the brake on the Hawk yesterday. Tuned up the shifting and voila! Finally the modifications are complete! Wow, impressive! Surprised that you were able to find tires/tubes outside the country for the Hawk rims. Lugs on the steel frame look good. Only premium frames come with lugs in the West these days. Cool, good to know! Btw, for tubes couldn't you use the local tubes inside the marathons? Yeah Arvind. I could have used the local tubes but it was conscious decision to move away from the woods valve tubes and move towards Presta. That way, I can use my RoadMorph G pump while on the road. can you please give details about brakes? i.e brake pads , cables,?what is the total cost of all these modifications? I have not changed the brake calipers. They are what came stock with the bike. I have changed the brake levers(drop bar brake levers) to CaneCreek SCR-5. Link below. If you don't have drop bars already on your bike, this link might be useful. But please be warned that all this conversion is a costly affair. Consider just changing the brake pads to some better brake pads available at Decathlon or your local bike shop. The seat post quick release is the one that is available at Decathlon. Even I too have a Hero Hawk which I'm thinking to reuse it. Thanks to the potholes in Bangalore which stops me from taking my cycle out. 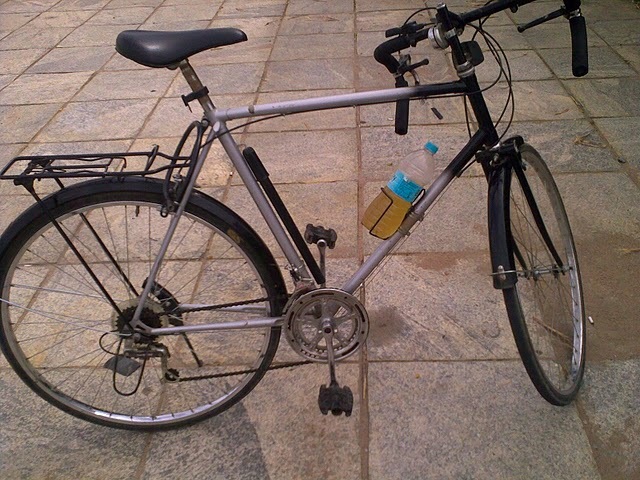 Now I want to repair my cycle can you suggest me some good cycle repairing shops in Bangalore where I can get genuine parts. I have got my cycle repaired thrice for freewheel and rim damage. I have a first generation hero hawk. Currently I am using 27"x1.25" (630x34mm) Ralson nylon tires. Can i seamlessly shift to 700cx35 (622x35mm) tyres. I am considering 700cx35 500ATP touring Btwin tyres for their puncture resistance and ride quality as compared to the locally available tires. Eventually I want to use hood brake levers. Are there any cheaper alternatives to the Cane Creek Scr 5 that you are using. Or should I just go ahead and get them. My friend from Usa will be making the purchase. Should i ask my friend to buy from Amazon or Harriscyclery.net. It would not be possible to get tires from Usa (too bulky). @dj2014: You cannot seamlessly shift to 700cx35 without changing the wheels. If you decide to change the rims to 700c you could change the tires to 700cx35. However, you would need an extra 4mm reach for the brake calipers. And your modified cycle was awesome can we get video on your cycle step by step modified YouTube or another video for tutorial purpose. Tire size is 27′, typical of all older road bikes. I no longer have this bike as I’ve passed it on to a friend. No idea, Sanjeev! You’ll have to try local bike shops (not the fancy ones). Wow! Good job bro! I was thinking of buying the hero hawk fixed gear and turn it into something like what you have done. A 8-9 cassette with ofcourse new type of quick release hubs (front and rear). Latest type of crank set, to start with. Do you think this would be a good idea? I like the geometry of this bike hence this thought. I couldn’t manage to get a frame-only anywhere. I don’t think it is worth the effort actually. But if you could get hold of an old frame, you could play around with it. Won’t be cheap though.